A portable counter top detection system that uses 3 AAA batteries. 3-way test authenticates currency, passports, drivers licenses, credit cards, and travelers checks. UV light reveals security thread while black light reveals watermarks. 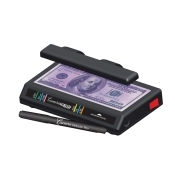 Also includes classic counterfeit pen to authenticate currency paper.